This was our first food tour and I wasn’t sure exactly what to expect, but it was one of my favorite parts of our entire vacation! Hungry Birds Food Tour is a street food tour. The guides are all locals (and food lovers!) and lead you through a ~4 hour walking tour of Amsterdam – with 10 different food stops along the way. The foods all represent Amsterdam in some way and are incredibly tasty! 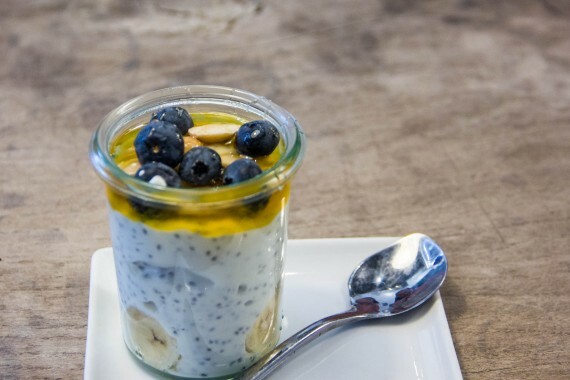 You even get to meet several of the owners for even more behind-the-food stories. 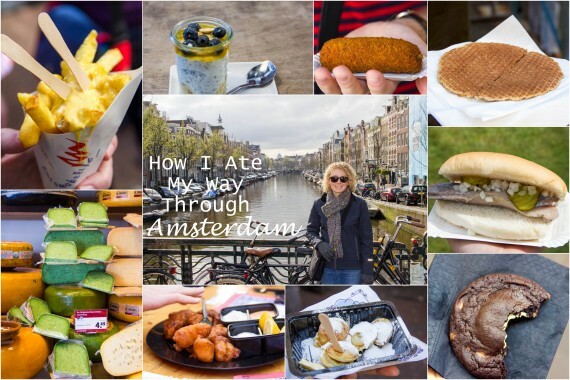 If you’re ever in Amsterdam, I HIGHLY recommend a Hungry Birds Food Tour! Each tour is a little different, but here’s a recap of ours. Enjoy! Our first stop was Febo for some croquettes. The Dutch are famous for their croquettes or bitterballen – typically a mixture beef or veal, beef broth, butter, and flour that are coated in breadcrumbs and deep fried. Jordan and I thought they tasted like deep fried gravy balls. We tried a couple different croquettes from Febo and my favorite by far was the Bami which was a mixture of noodles, vegetables, and chicken. 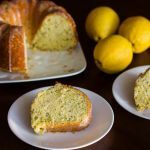 It was reminiscent of an egg roll and it was delicious! 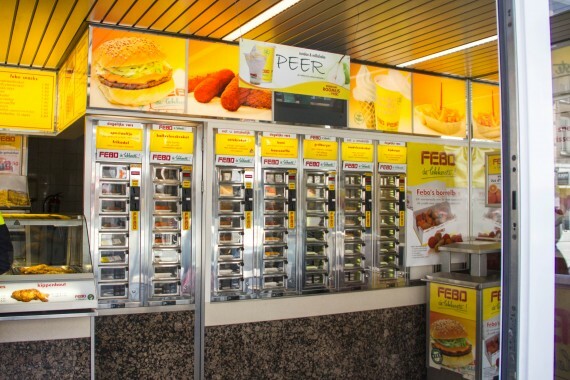 But what’s really cool about Febo is their “hot vending machines”. 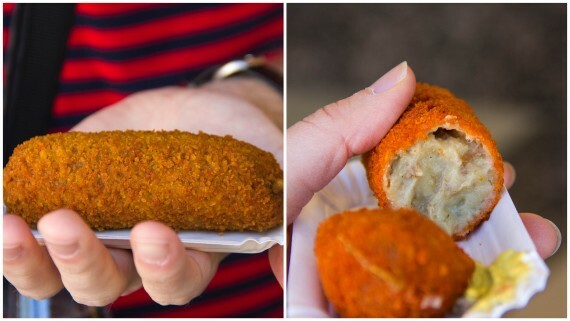 Febo was started back in 1941 by a guy who made really good croquettes and started selling them. His croquettes became so popular that he came up with his hot vending machine idea so people could avoid waiting in line. 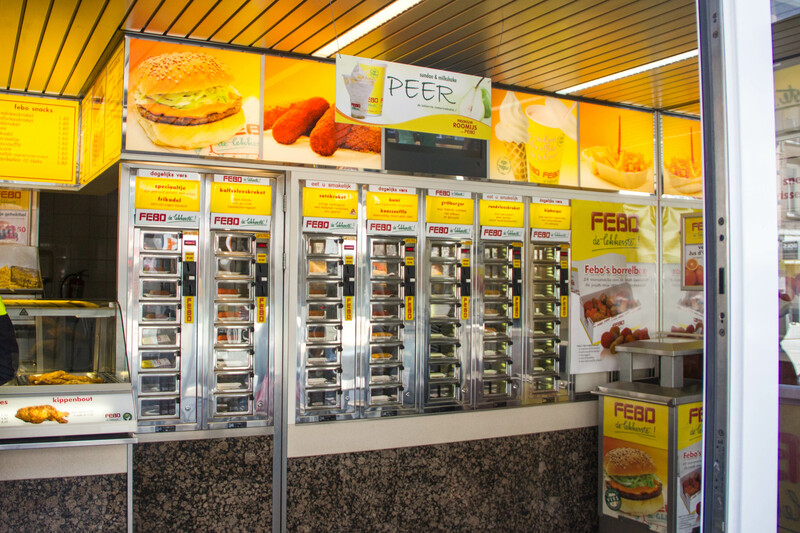 Febo is a franchised company now, but the Febo that we stopped at was one of the first ones, and the daughter of the original owner came out and told us the Febo story. Super cool =). The Dutch eat a lot of dairy – milk, yogurt, cheese, etc. Our second stop was yogurt with chia seeds, sliced banana, fresh blueberries, almonds, and mango syrup…soo good! 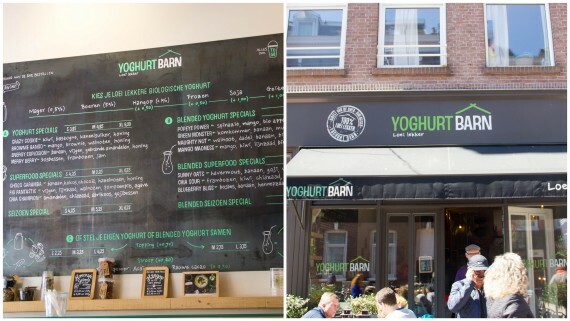 I had yogurt every morning while I was there and they really do have great yogurt in the Netherlands. There’s no way we would have found Tjin’s on our own. 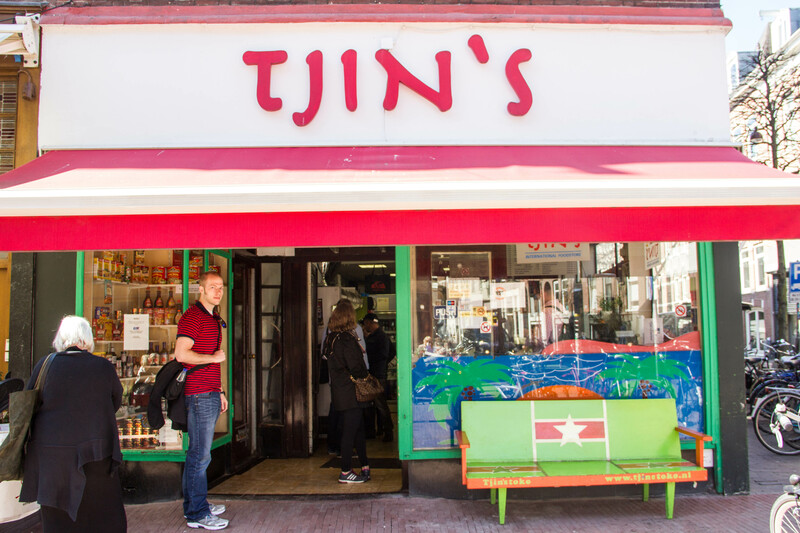 Tjin’s is an international food store with a small deli-type restaurant at the front. It’s pretty much a locals-only type of place but what a gem! 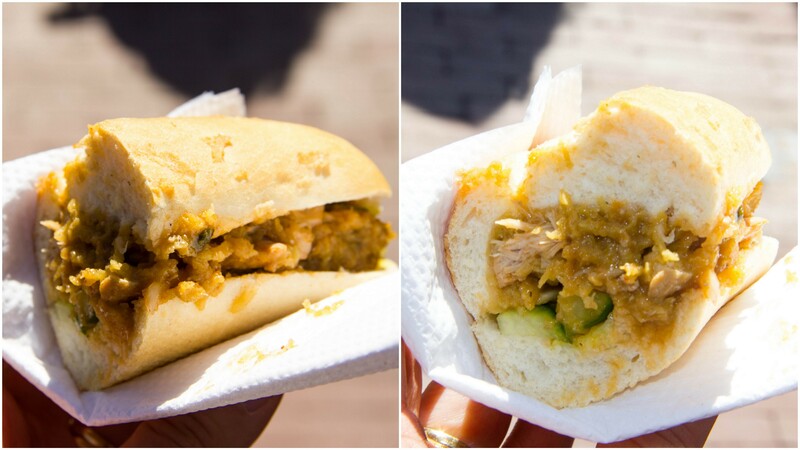 We tried their Broodje Pom which is a Surinamese sandwich filled with chicken, a starchy root vegetable (? ), and lots of spices topped with a relish of pickled vegetables and some cucumber (not really sure what else). It was one of the most delicious sandwiches I’ve ever had – the perfect spicy and (slightly) sweet combo. I kept having to actively remind myself that we had 7 more stops ;). You’ll find lots of Surinamese influenced food in Amsterdam since Suriname (a small country in South America) was originally colonized by the Dutch. It was a food tour + history lesson =). 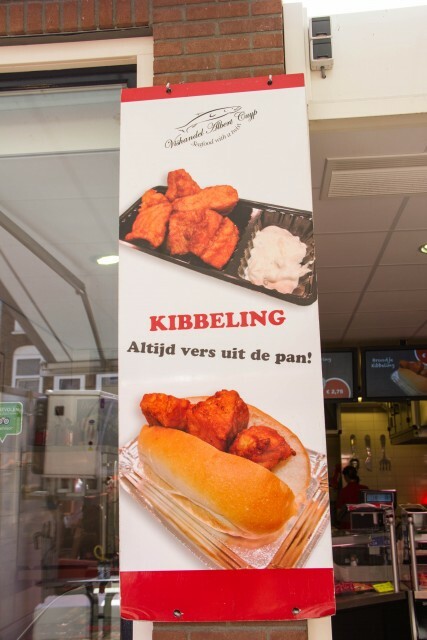 At the same stop we tried Kibbeling – lightly battered, deep fried cod. 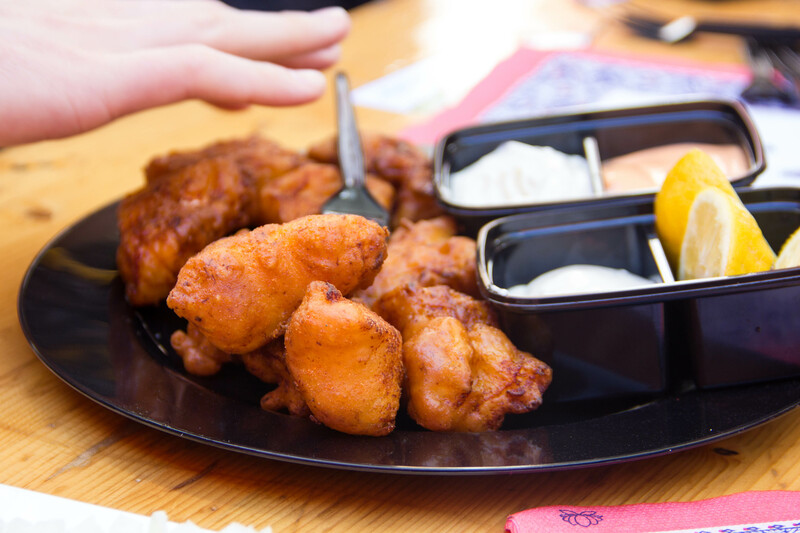 Basically, grown-up fish nuggets. Jordan was in heaven! He loves fried fish of any kind, especially cod. 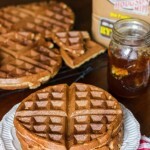 The batter was super light and crispy. 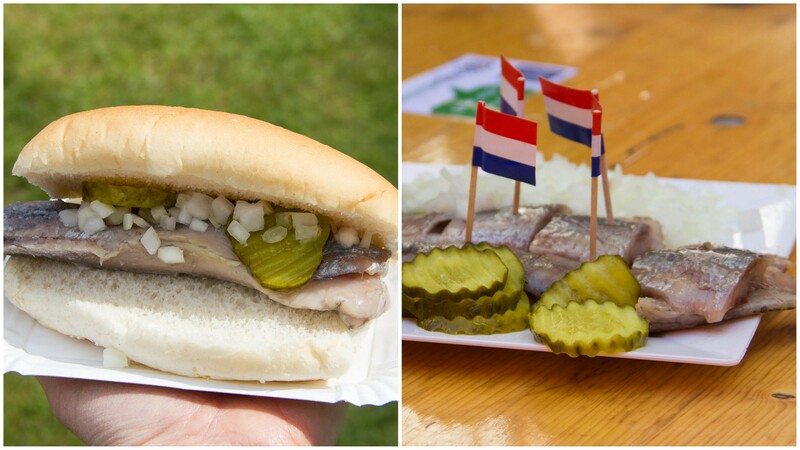 It was good, but I liked the herring better =). 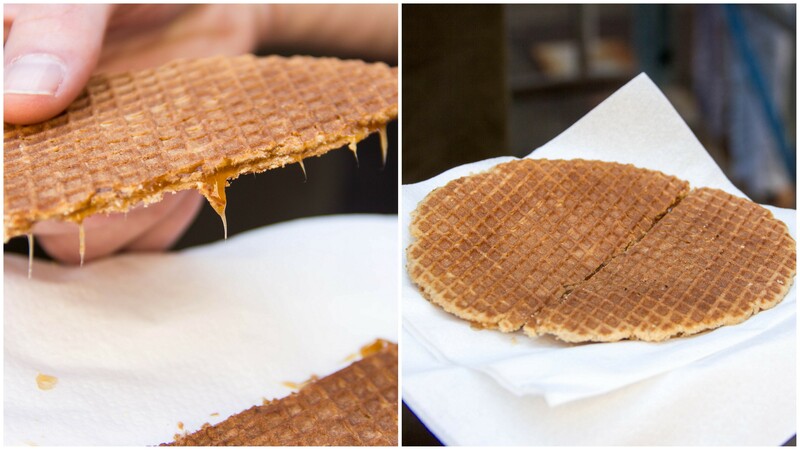 Stroopwafels originate in the Netherlands and are made by sandwiching two crispy, waffle cookies around a caramel butter syrup. They are every bit as good as they sound! Jordan went crazy over these. Crazy as in, we went back a couple days later and he ate two more ;). 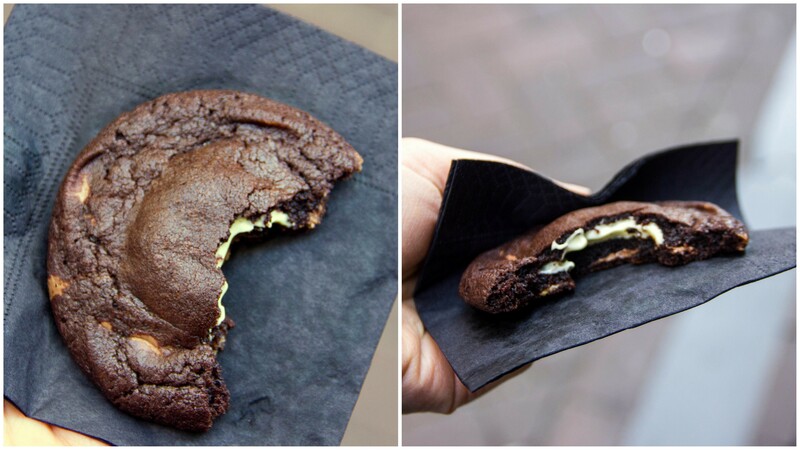 The cookies are made fresh to order, so the filling is still warm and gooey…yum! 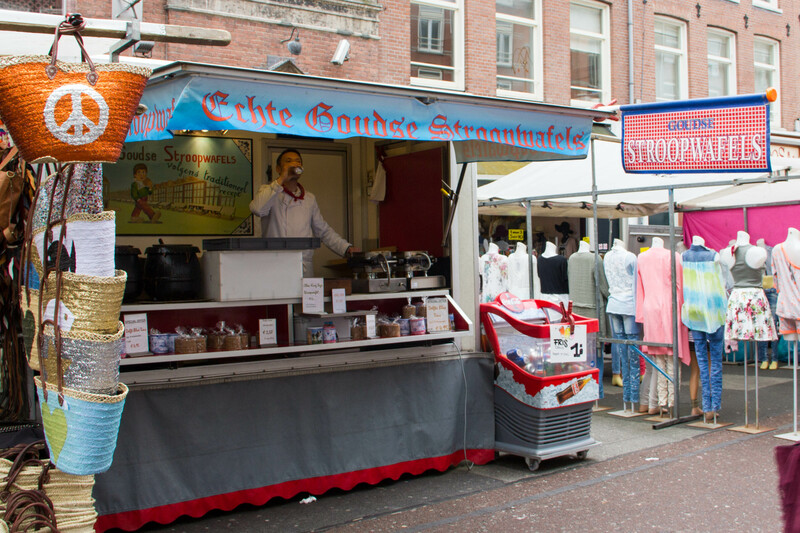 According to our guide the owner of this cart makes the best stroopwafels in town using a very old (and very secret) recipe from the Gouda area of the Netherlands. Another sweet traditional Dutch treat, poffertjes are small, fluffy pancakes. 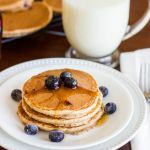 They are made from a yeasted buckwheat batter and traditionally topped with butter and powdered sugar. 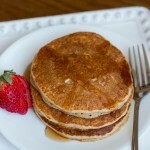 They have a slightly different texture than american pancakes. 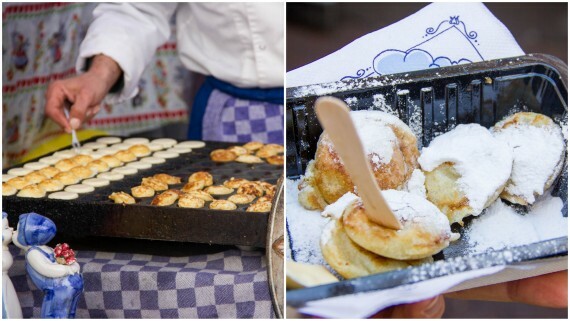 We had poffertjes no less than 4 times in our one week stay. 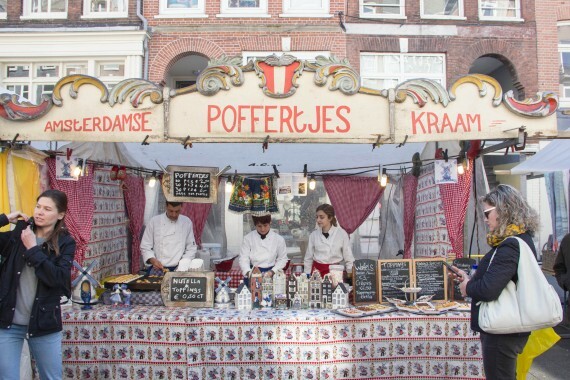 Jordan even tried to convince me to buy a poffertjes pan at a kitchen store before we left haha. 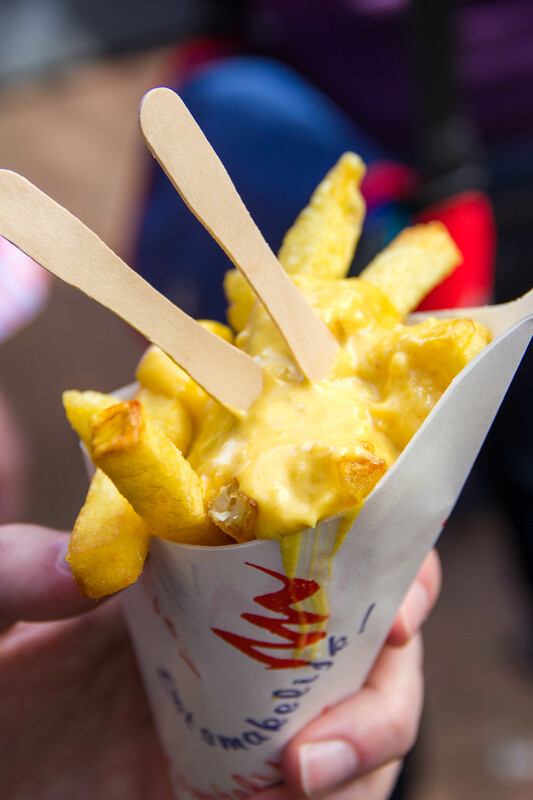 The Dutch love their french fries! 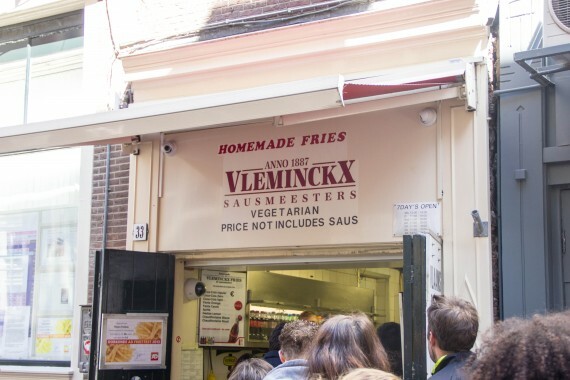 Vleminckx has been serving fries since 1957 and that’s all they serve! So they must be good, right? They have lots of different sauce options. Our tour guide recommended the “War Fries”, which is a mayo-peanut sauce topped with some chopped onions. Since Jordan and I aren’t big mayo fans, we opted for the mango curry sauce which is also a classic “Dutch” option. The mango curry sauce was the bomb dot com ;). I can’t imagine that the war sauce could be any better. You find lots of Indonesian influence in Dutch food since Indonesia was the largest former Dutch colony. 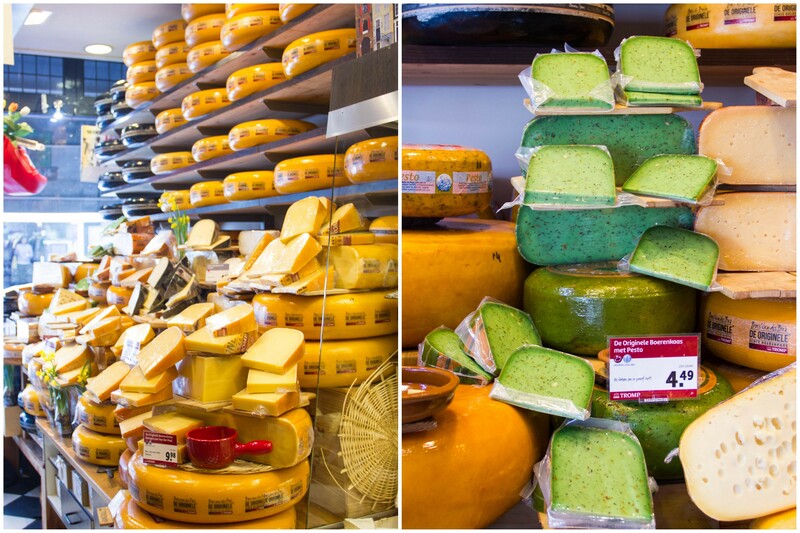 I can’t remember the name of this cheese house (maybe Tromp?) but it was such a unique store. There’s no counter separating the staff from the customers. The staff just kind of mingle around and are super helpful. All the staff are very young. The oldest employee at this store is 26 years old. 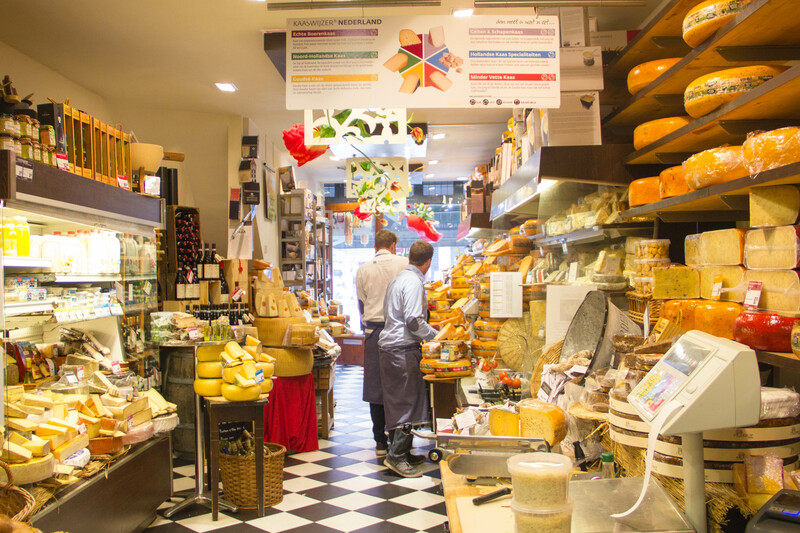 We tasted a variety of their cheeses and there wasn’t one I didn’t like – young, old, pesto, cumin…they were all delicious! At Van Stapele they only sell one kind of cookie – a dark chocolate cookie with a white chocolate center. The owner worked for months perfecting her cookie and they were delicious. 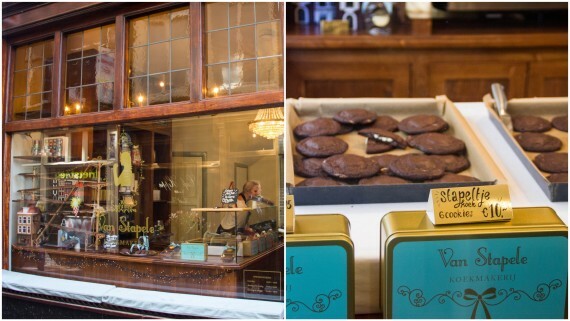 The cookies are baked fresh throughout the day and she frequently sells out. 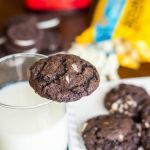 In fact, if you want to make sure you get a cookie you have to order them in advance! 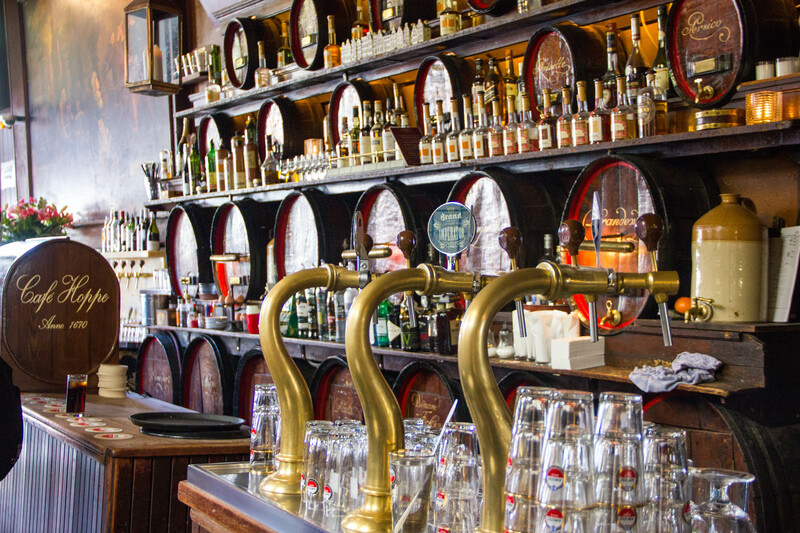 Cafe Hoppe has been around since 1670! They serve all kinds of alcohol and typical pub food (including bitterballen). Our tour included some type of local liquor (I can’t remember the name), but I had a Coke Light instead. 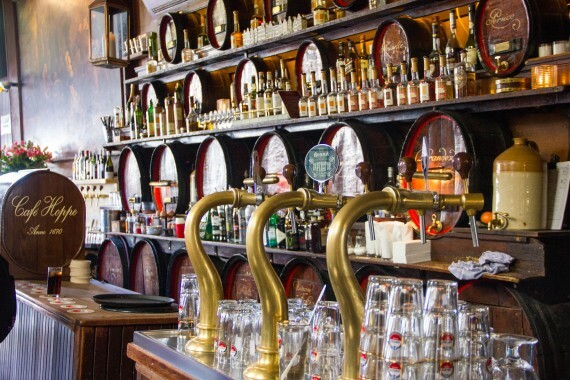 I can’t speak for their alcohol, but it’s a gorgeous old pub with wood paneling and sawdust on the floors =).